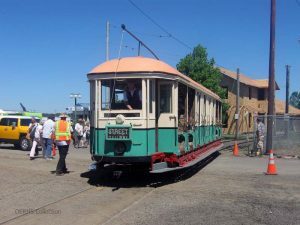 A total of 626 O class cars were built for the Sydney tramways between 1908 and 1914. It was the largest class of car ever ordered for Sydney. The crossbench seating in a combination of open and enclosed sections carry 80 passengers. The Sydney press referred to them as “Toast racks”. this type of car is a nice way to travel on a hot summer day. US streetcar lines also had open cars to take advantage of “air conditioning”, they were normally called “Breezers” in the US. The mechanically simple cars were considered trouble-free in operation. 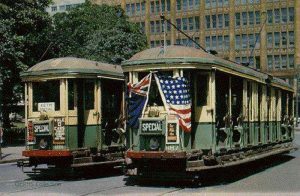 For 40 years they were the backbone of the fleet, and saw service on all the Sydney electrified lines. The last cars of this class ended operations in 1958. Tram car 1187 was donated to the Museum by the Department of Public Transport, New South Wales, Sydney, Australia. It arrived in Portland aboard the Matson Line Vessel, Ventura, on September 26, 1959. In November it was trucked to Glenwood, where it became the main operating car for the Museum. In 1998 This car operated as the first revenue trolley at our then new Museum site in Brooks, with a generator providing the current. In July 1999, this same car again made history. 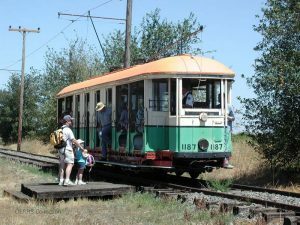 It was the first revenue trolley to operate under the newly electrified trolley wire at the museum. 1187 is the museum’s workhorse car. It provides most of our revenue operation. It is great during summer months. The museum is finishing up a cosmetic restoration job. It has a new roof, repaired woodwork and a fresh coat of paint as of 2007.